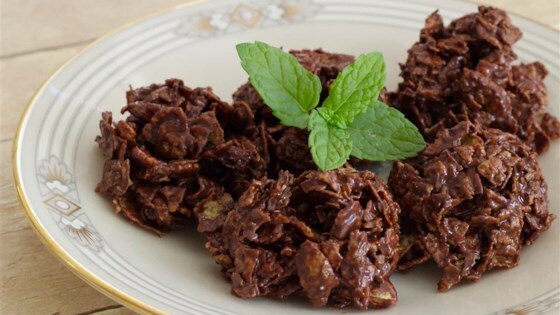 "Sweet and salty, these cookies are quick and easy to make, requiring only 3 ingredients." Combine chocolate chips and peanut butter in a saucepan over low heat; cook and stir until melted, 2 to 3 minutes. Stir in cornflakes until coated. Drop spoonfuls of the cornflake mixture onto a baking sheet lined with waxed paper. Chill in the refrigerator until cool, about 30 minutes. This recipe was very easy to make. The peanut butter was barely noticeable so I will up the amount I use next time. The kiddos I served these to had no complaints.